This is a particularly important experiment in our series of experiments dealing with the reflection of light because it reinforces the students' knowledge of the laws of reflection by a plane mirror and applies it to other situations. The first part of the experiment stresses the observation of the path of parallel incident light beams which are reflected by a concave mirror and, in this context, the introduction of the term "focal point". In the second part of the experiment, the paths of three selected light beams are experimentally determined and thus form the general prerequisite for the understanding of image formation which is to be covered later. The second part of the experiment is thus more demanding on the abilities and experimental proficiency of the students. The two experiments can be seen as a unit. 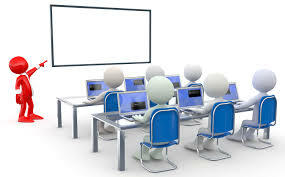 However, each of it can be performed separately; and in the interest of careful performance and development of experimental proficiency we recommend to do that. Alternatively we can recommend an approach where each group of students investigates the path of a different selected beam of light; these results can then be pooled at the end of the experiment. Whenever light, travelling in one medium, comes in contact with surface of another medium, a part of it is returned into the first medium. The phenomenon of returning of light into first medium is known as reflection of light. 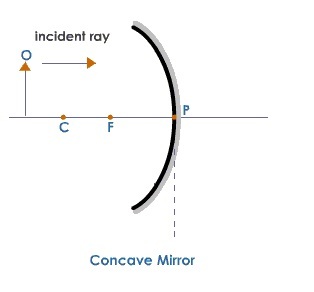 A concave mirror is that spherical mirror in which the reflection of light takes place at the concave surface i.e. bent-in surface. It is the center of the reflecting surface of the concave mirror also called vertex of mirror, generally denoted by letter ‘P’. It is the center of that sphere of which the concave mirror forms a part, denoted by letter ‘C’. 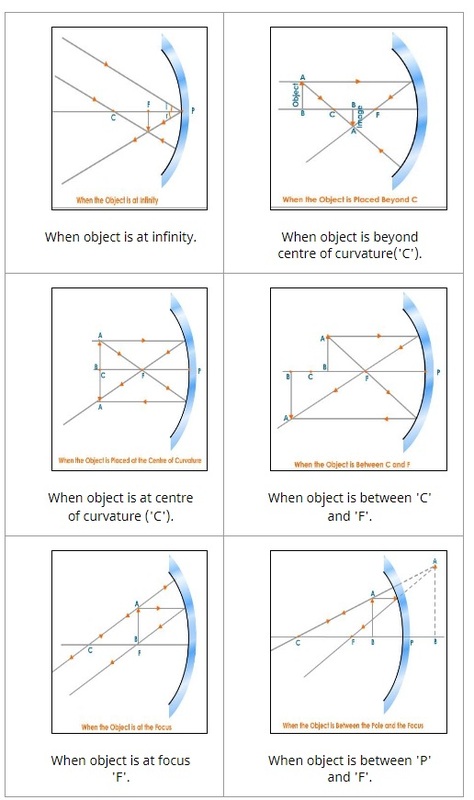 The straight line passing through the center of curvature and pole of concave mirror is called its principal axis. A beam of light incident parallel to the principal axis, after reflection from the spherical mirror, either actually converges to or appears to diverge from a fixed point on the principal axis. The fixed point is called the ‘Principal focus’, denoted by letter 'F'. 1) The angle of incidence is equal to the angle of reflection. 2) The incident ray, the reflected ray and the normal at the point of incidence, all lie in the same plane. 1) Real image: If the reflected rays actually meet at a point, then the image formed is real. It can be obtained on screen. 2) Virtual Image: If the reflected rays do not actually meet at a point but appear to diverge from a point, then the image formed is virtual. A concave mirror, a mirror holder, a semi transparent screen fixed to a stand and a small candle with stand. 1. Fix the concave mirror in the mirror holder and place it on edge of the table. 2. Mount a small candle vertically on a stand. Place it in front of the concave mirror on the left hand side (i.e. shiny surface) say on focus 'F'. 3. Place the screen such that the lower level of screen must be so arranged that it remains just above the principal axis of the mirror. 4. Locate a sharp image of candle by adjusting the position of the screen. Note and record the position and nature of the image formed on the screen. 5. Repeat the experiment by placing candle at different positions as mentioned in observation table [Table 1] below.